Let the graceful look and cozy feel of the Amish 9 Spindle Windsor Dining Chair light up your lovely kitchen or commercial dining room. The simple and refined nature of colonial style furniture makes it the perfect fit for the relaxed air and homey feel of country style furniture collections. The two combine beautifully to offer all the comfort, style and function you're looking for in kitchen or dining room seating. 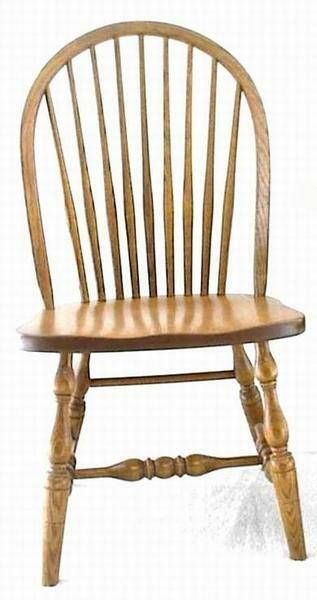 The Windsor Chair has seen many additions and changes throughout the years. It's commitment to comfort keeps it a favorite among home furniture collections. Learn the history of the Windsor Dining Chair in our Learning Center. These dining chairs can be custom made for your restaurant or commercial dining room. Visit our Contract Furniture Sales page to learn about custom quotes.